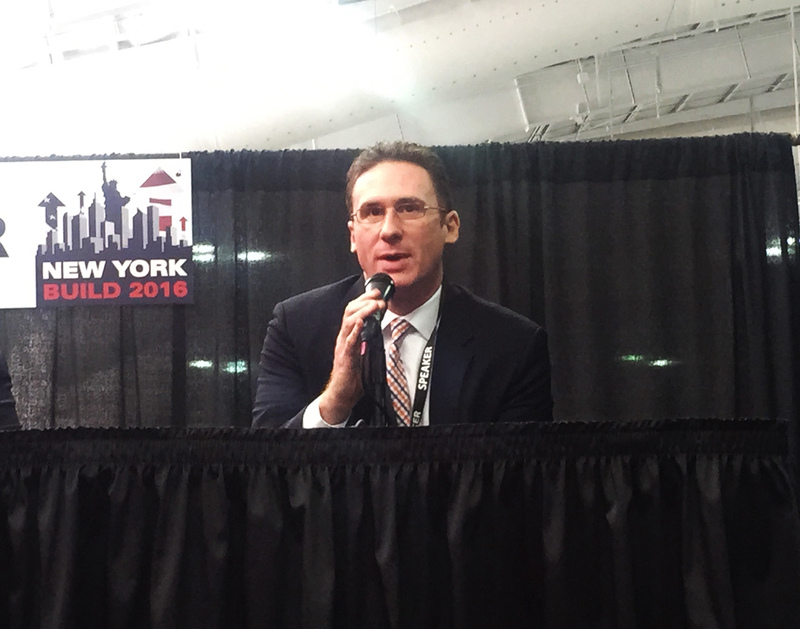 Capalino+Company was thrilled to participate in this year’s New York Build Expo. Held at the Jacob Javits Center in March, the Expo brought over 5,000 leaders in New York’s real estate and construction industry together for a comprehensive exhibit and workshops to discuss current trends in the industry. 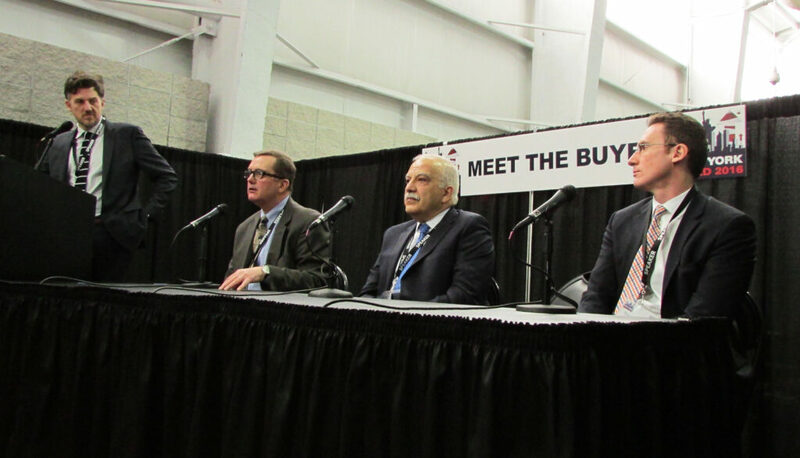 Officials from New York’s government agencies, major developers, architects, engineers, contractors and suppliers from prominent companies across the globe were well represented. Travis drove the discussion on what it takes to successfully do business with New York City. Capalino+Company’s Chief Operating Officer Travis Terry joined leading industry experts on a panel entitled “Meet the Government Agencies”, geared towards discussing Mayor de Blasio’s housing agenda, important land use and zoning changes, government regulations and major city projects. Utilizing his knowledge of working with government, leading real estate companies and developers in the city, Travis drove the discussion on what it takes to successfully do business with New York City. The panel opened with keynote speaker Commissioner Rick Chandler of the Department of Buildings who highlighted his department’s goal to promote both new development and job safety and what changes are being implemented to achieve that balance. Moderated by Brian Loughlin, Director of New York City Housing Authority, the panel included George Toma, Vice President of Construction Management and Operations at NYC School Construction Authority, and Ronald Piester, NYS Department of State’s Director of Division of Building Standards and Codes. Travis was able to discuss in detail how the Mayor’s ambitious housing agenda has wide implications for new developments and land use policy in New York. He went on to note that creating new housing requires a careful analysis and a blend of elements in addition to new units: schools, parks, libraries and communities are all things used to make developments more attractive to communities. Stakeholders see the changing demographics of the city, and we help our clients find that critical balance between promoting new development by building new units while maintaining the integrity of long existing neighborhoods and its residents. The Mayor’s Housing New York plan lays out the goal of providing significant opportunities for greater equity in the housing market while, continuing to recognize the need for developers to generate income from housing development. While the future is uncertain and change can be complex to manage, individuals such as Mayor de Blasio and City Planning Commission Chairman Carl Weisbrod see themselves as leading efforts to address these problems through housing and zoning initiatives and legislation. Capalino+Company has written extensively about these initiatives, including 421a tax incentive program, Zoning for Quality and Affordability (ZQA) and Mandatory Inclusionary Zoning (MIH). Read our most recent Land Use Bulletin: City Planning Commission Approves Two Major Zoning Initiatives. Travis also focused on furthering the dialogue on how to successfully get approvals and permits from NYC government agencies. He emphasized the importance implementing a Corporate Social Responsibility (CSR) agenda not only company-wide, but also on a project-by-project basis. CSR elevates your brand by strategically positioning your company as good corporate citizens, and ensures that community stakeholders have a positive view of your work. “To get a project done in NYC, it’s important to have a CSR practice so when you’re going before community board or agency you can point to all the great work you’ve done in the community,” said Travis Terry. To learn more about how Capalino+Company and how we can help you succeed in NYC please visit our services page http://www.capalino.com/services/ or email Travis at Travis@capalino.com. To view more photos of Travis and the Capalino+Company team at New York Build, visit our Facebook page.